Coimbatore : The battle lines seem to be drawn between MDMK and BJP with incidents between the two cropping up regularly. 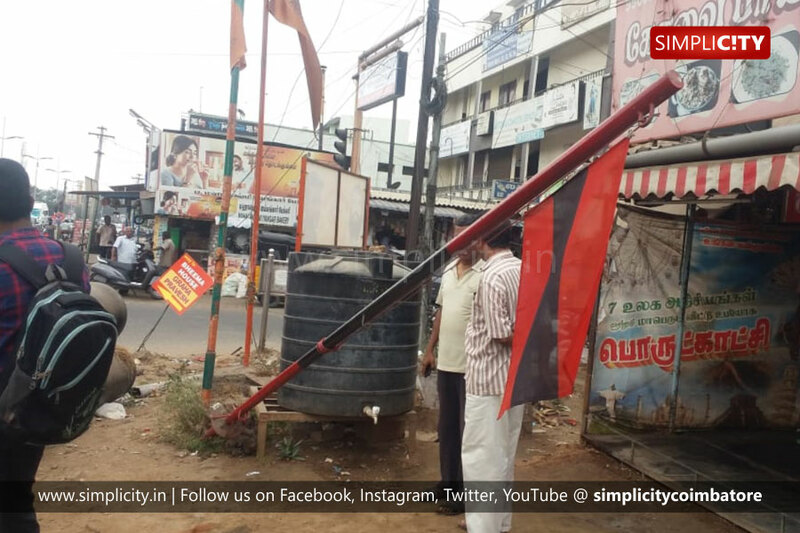 The flag-post of MDMK at GN Mills was pulled down by unknown people on Monday. Alleging that the District BJP cadres and the Hindu outfits were behind the incident, the MDMK Kavundampalayam in-charge, Sampath filed a formal complaint with the Thudiyalur police station, today. The police are scrutinizing the CCTV footage procured from the spot to identify the offenders. However, the MDMK suspect that the Hindu outfits and the BJP could be behind the incident, as MDMK Chief Vaiko staged a black flag agitation during PM Modi's visit to Tirupur. It may be noted that ahead of the PM's visit, posters threatening Vaiko were stuck in Tirupur and Coimbatore, and cases were filed on BJP in Tirupur for erecting banners posing threat to Vaiko.